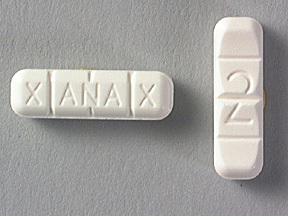 Xanax is a Brand name for a benzodiazepine drug that contains alprazolam as an active ingredient. It has effects on chemicals in the brain that may be unbalanced in people with anxiety. Xanax is available in following forms and doses: immediate release tablets in doses of 0.25 mg, 0.5 mg, 1 mg and 2 mg and as extended release tablets (Xanax XR) in doses of 0.5 mg, 1 mg, 2 mg and 3 mg. Differences between different colors of Xanax tablets are in alprazolam dose and in type of the tablet (immediate or extended release). Xanax 0.25 mg immediate-release tablets are white. Xanax 0.5 mg immediate-release tablets are orange. and Xanax XR extended-release tablets of 0.5 mg are also white but designed in 5-side shape. Xanax bar is actually Xanax tablet of 2 mg that is shaped like a bar or stick so it can be easily divided into 1/4s of 0.5 mg. This formulation allows exact and the best distribution of 0.5 mg of alprazolam in every quarter of a bar. Alprazolam is a benzodiazepine drug that works by nonspecifically binding to the benzodiazepine receptors BNZ1, which are responsible for sleep sleep, and BNZ2, which are responsible for muscle relaxation, motor coordination, anticonvulsant activity and memory. Alprazolam can be also coupled to GABAa – gamma-aminobutyric acid-A receptors, so this interaction enhances the effects of GABA in the brain, which is strong inhibitory neurotransmitter, by increasing GABA affinity for the GABA receptor. When GABA binds to its receptors, it opens chloride channels, resulting in a membrane hyperpolarization that prevents further cell excitation. Different from clorazepate, chlordiazepoxide and prazepam, alprazolam has a much shorter half-life and its metabolites have a minimal activity. Similar to triazolam, alprazolam may have important drug interactions that involve the hepatic cytochrome P-450 3A4 isoenzyme. Like all benzodiazepines, alprazolam may also cause a dose-related CNS depression varying from mild impairment of performing tasks to hypnosis. Another difference from other benzodiazepines is that alprazolam may also have some antidepressant activity; however there are no major clinical evidences for it. If these effects are mild, they will probably go away within a few days or a couple of weeks. If they’re more severe or don’t go away, patients should talk with their doctor or pharmacist. The next table shows serious side effects that can happen after Xanax use. Patients should call their doctor immediately if they exhibit such side effects. Patients with depression. In those with pre-existing depression, Xanax may make their condition much worse, because of its CNS depressive effects. If depression gets worse or patients have suicidal thoughts, doctor should be called immediately. Episodes of hypomania and mania have also been reported in depressed patients treated Xanax. Patients with acute narrow-angle glaucoma and untreated open-angle glaucoma. Xanax can make this condition worse. Do not take Xanax if you have acute narrow-angle glaucoma. Xanax has anticholinergic effects; however it has been very rarely associated with increased intraocular pressure. People with a history of alcoholism, drug abuse, or personality disorder. Xanax can lead to psychological physical and addiction. Patients with a history of these conditions may have a greater risk of addiction to this drug. Patients with renal or liver disease. Xanax is metabolized by the liver, and metabolites are excreted in the urine. For patients with lower kidney or liver function it may be harder for metabolize and eliminate this drug from the body. This can increase the amount of the Xanax in blood, and may increase the risk of causing serious side effects. Patients with severe lung disease. Like all benzodiazepines, Xanax may also cause respiratory depression and apnea, usually when it is given in high doses. However, some patients may be more sensitive to recommendable dosages such as elderly, debilitated or severely ill patients, patients on other CNS depressants, and those with limited ventilatory function, chronic pulmonary insufficiency or other respiratory disorders. Therapy with Xanax must be administered cautiously and monitor closely in these patients. Patients with epilepsy. Xanax may increase the incidence or precipitate the onset of generalized tonic-clonic seizures attacks in patients with epilepsy. Also, abrupt cessation of Xanax may precipitate seizures attacks as withdrawal symptoms, in generally after prolonged use of CNS depressants. Status epilepticus may also occur if long term Xanax therapy is rapidly withdrawn. Obese patients. The plasma half-lives of Xanax may be prolonged in obese patients, likely because increased distribution into fat. The amount of the drug can be increased in their body, which can lead to increased risk of side effects to happen. Xanax should be administered cautiously in obese patients, with careful monitoring of CNS status. Pregnant women. This drug is classified in the FDA pregnancy category D list of drugs. That means: Studies in humans has shown adverse effects to the fetus when the mother takes the drug. This drug should only be used during pregnancy in serious cases where it’s needed to treat a dangerous condition in the mother. Patients should talk with their doctor if they are pregnant or plan to become pregnant. Doctor should tell you about the specific harm that may be done to the fetus when this drug is used. This drug should be only used if the potential risk to the fetus is acceptable given the drug’s potential benefits. Mothers who are breast-feeding. Alprazolam may pass into breast milk and may cause side effects in infant. Infant may become drowsy and lose weight. Mothers who are breast-feeding should talk with their doctor, and they may need to decide whether to stop taking this medication or stop breast-feeding. Elderly who are over the age of 65 years may become more sensitive to the sedative side effects Xanax. They will be more likely drowsy. Doctors should monitor such patients closely. Also, they should take extra care to avoid falls that may be caused by drowsiness or dizziness. Xanax should never be given to a child younger than 18 years of age. What happens if I miss Xanax dose? What happens if I overdose Xanax? Seek emergency medical attention or call the Poison Help line at 1-800-222-1222. An overdose of alprazolam can be fatal. Overdose symptoms may include extreme confusion, drowsiness, muscle weakness, feeling light-headed, fainting and loss of balance or coordination. Immediate-release tablets initial dose: 0.25 to 0.5 mg orally 3 times a day. Dose may be gradually increased every 3 to 4 days if needed and tolerated. Immediate-release tablets initial dose: 0.5 mg orally 3 times a day. Dose may be gradually increased every 3 to 4 days if needed and tolerated. Extended-release tablets initial dose: 0.5 to 1 mg once a day. The daily dose may be gradually increased by no more than 1 mg every 3 to 4 days if needed and tolerated. Immediate-release tablets initial dose: 0.5 mg orally 3 times a day. The daily dose may be gradually increased by no more than 1 mg every 3 to 4 days. How long does it take Xanax to work? After oral administration, Xanax is readily absorbed. Xanax work very quickly, after 20-30 minutes. Maximum concentrations in the plasma occur in 1 to 2 hours after following administration. Its full effects last an average of about 5 hours. Xanax may remain in your bloodstream long after its effects are gone. That is because Xanax average half-life is about 11 hours. A drug’s half-life is the time it takes for half of the dose in the blood to be eliminated. For Xanax, it takes about 11 hours to eliminate half of the dose taken and several half-lives for the drug to be completely eliminated. However, different factors may have impact on duration of drug action such as age, weight, kidney or liver disease, which can all cause a prolongation of its elimination. So for some patients, a small amount of Xanax may stay in the body even after two or more days after taking just one dose. Furthermore, if Xanax is taken regularly, higher levels of the drug may maintain in the bloodstream, since it tends to accumulate. It may take several weeks for Xanax to be completely eliminated from your body. Xanax passes from into urine and can be detected in drug tests long after you have taken the last dose. Xanax + Acid reducers (ranitidine, famotidine, pantoprazole, omeprazole, esomeprazole etc…). Drugs that lower acid production in the stomach may prevent Xanax from being absorbed into the blood properly, thus greatly reducing the concentration of the drug and its efficacy. Xanax + Painkillers (codeine, morphine, hydrocodone and oxycodone). Narcotic pain relievers can add sedation and drowsiness side effects if they are taken together with Xanax. Patients who are taking these drugs with Xanax should always do according to their doctor’s advice. In most cases, the dosages of these drugs have to be reduced in order to prevent severe side effects. Xanax + Diphenhydramine. Many of the OTC products that are used to treat allergy and cold symptoms contain diphenhydramine as active ingredient, a drug very known to cause extreme drowsiness. Patients should be sure to mention all of the medications they take to their pharmacists in order to monitor for potential issues. Xanax + OTC Sleep Aids. Xanax and sleep aid herbal (valeriana or hop) or melatonin supplements and remedies such as Unisom, Sleep Ease, Simply Sleep and different Melatonin products may increase sedation and drowsiness if they are used together. Patients should keep in mind that these preparations are usually also available in generic form. If there are questions or concerns regarding these medications, patients can get more information from their pharmacists. Xanax + Prescription Sleep Aids. Prescription sleep aids such as Lunata, Ambien, Trazodone, Sonata, Lunasta and Halzion are much more effective than OTC sleep aid drugs, so they are likely to interact with Xanax and cause side effects. Interaction can result in severe depression of the respiratory system, and may dangerously slow heart rate causing coma and even death. Xanax + Propoxyphene. Propoxyphene is a narcotic drug that is used to treat mild to moderate pain when OTC pain relievers are not effective. It is available under next Brand names: Darvon, Darvocet, Balacet and Propacet. Using Xanax together with propoxyphene may increase side effects such as dizziness, confusion, drowsiness, and difficulty concentrating. Some people, especially the elderly, may also experience impairment in judgment, thinking and motor coordination. Xanax + Ketoconazole. Using ketoconazole and Xanax is not recommended. Using these drugs together can cause slowed breathing, sedation and drowsiness. Although Xanax is a very commonly prescribed drug which is used for the most conditions, there is a high potential for Xanax to cause addiction and abuse. Xanax may cause two different types of addiction: physical dependence and mental addiction. When someone is using controlled substance for a long-term period, body become used to this substance, may incorporate in body normal metabolism so the body must have it in order to function properly. So, if this substance is no longer in the body, patients will experience different symptoms that most commonly drive them to take more of this substance. On the other hand, mental addictions, especially when anti-anxiety drug is in question, are very difficult to break. 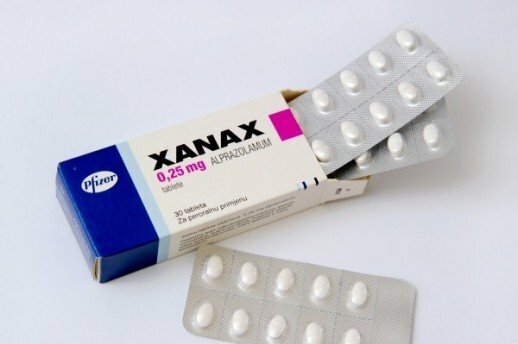 Patients who have mental addiction to Xanax are unable to fend off panic attacks and other anxiety attacks on their own, and they need to continue with this drug for a long-term use in order to feel them safe. While doctors and pharmacists are ensuring that patients understand how to properly take their drugs, it is however individual thing for a patient itself to make a conscious decision to take their drugs correctly. The number one way to prevent addiction caused by benzodiazepines such as Xanax is to take the drug exactly as it has been directed and prescribe and never at a higher dosage or more frequently! Patients who feel as if they are beginning to become addicted to Xanax should speak with their doctors and possibly find another course of treatment with less potential for side effects. Xanax abuse is also a big problem for many persons worldwide. This drug is produced in order to help individuals who suffer from anxiety. But people often choose to buy the drug off the street in order to get high. This is a very serious problem, not only for someone health, but also for society. Many groups and organizations are formed in order to put an end of Xanax and other prescription drugs abuse. Also, patients can also do their part by keeping the drugs out of the reach of others and by properly disposing it. Those who abuse Xanax or other prescription drugs may need an expert intervention and treatment in an inpatient facility in order to break the habit. These treatment options are completely confidential and covered by most health insurance plans; they can be found by contacting substance abuse looking in the local Yellow Pages or hotlines. Patients, who uses benzodiazepines such as Xanax for a long period of time and suddenly stops using it, may develop severe symptoms of withdrawal that may lead to a serious health problem known as benzodiazepines withdrawal. Also, in some not so common cases patients can experience high blood pressure and even seizures that in some cases may be fatal if they are not treated quickly. Seizures are among the most serious symptoms, but also delirium, delusions and hallucinations. Many of these symptoms will resolve with time, but some of them require medical help. Avoiding Xanax is the best way to treat its withdrawal in the first place. This is the best option for most doctors who prescribe Xanax to their patients. Principal of therapy should be next: low doses which are taken only when absolutely is needed are much better than higher doses taken frequently. Patients who need to take benzodiazepines on a regular basis may find that other drugs will work just as well and carry less risk, like Clonazepam and Valium. So, patients who are concerned about experiencing withdrawal should always speak with their doctors and pharmacists about the best way to take or stop taking the drug in order to avoid these symptoms. Why patients should never take Xanax together with alcohol? If these side effects further progress or if the consumption of alcohol is significant, patients may experience serious side effects such as slowed heart rate and respiratory issues such as difficulty breathing. Such side effects may lead to coma or even death if it is not immediately treated. Can I take Xanax with Grapefruit juice? Grapefruit juice may block certain enzymes that can be responsible for drug metabolism or prevention of drug high amounts absorption into the bloodstream. When pharmaceutical companies develop dosages for their products, they will generally take these enzymes into account. However, when grapefruit juice blocks these enzymes, high amounts of the drug may be able to enter into bloodstream this may increase the risk of side effects to happen and possible overdose. When patients take Xanax and grapefruit at the same time, they may experience higher effects of drowsiness and dizziness. This is because more of the drug is in bloodstream. Studies have failed to discover how much of the drug does fruit allow into the system, but these studies were relatively unsuccessful because the absorption rate varies from patient to patient. Also, apart from this, many patients have reported gastrointestinal upset and nausea when they drink grapefruit juice or eat the fruit either directly before or after ingesting some of benzodiazepine drug. In order to avoid these side effects, patients should never drink grapefruit juice and take Xanax within 24 hours of one another; this time allows the Xanax to be metabolized and eliminated from the body.